This resource has been designed to help Boy Scouts learn to make pottery and fulfill their requirements for the BSA Pottery Merit Badge. This page follows the Pottery Merit Badge Workbook format. Follow the in text links to learn more about the subjects. Tools - The main safety risk with tools is being cut or punctured. Clay carving knives and cutting needles are used frequently in pottery. Care should be taken to point sharp ends away from the body when using. Be sure to keep them in a sturdy container away from children when not in use. Pottery Wheel - The pottery wheel has a rapidly spinning wheel. Care must be taken to prevent fingers or clothing from getting caught in the wheel or between the wheel and the splash guard. Electric wheels have power cords that must be kept dry and out of walkways to avoid electric shock and tripping. Kick wheels have heavy wheels. Care must be taken not to step on the spinning wheel and being knocked to the ground when climbing off the kick wheel. Kilns - Kilns must be used with extra caution. As they frequently reach temperatures of over 2000 degrees it is important that they are located in a suitable spot away from any flammable materials or structures. The heat source also must be installed correctly to avoid fire and electric shock. It is also important not to touch a hot kiln. Proper eye wear should be used if looking into a hot kiln to avoid eye injury. Kilns should also be properly vented to prevent inhalation of potentially toxic fumes released during firing. Other equipment - Clay mixers, pug mills, and other large machines must be used with care according to the manufacturers directions to avoid being caught in the machine. Materials - Many of the materials used in pottery can be toxic. Glaze materials such as lead, cobalt, and other minerals must be stored safely and handled with care to avoid ingestion or exposure to skin. Clay in it's wet form is generally harmless, however, clay in powdered form can be harmful if inhaled. Care should be taken to clean up powdered clay, use an appropriate mask if working with dry clay, and use clay in moist form. Clay bodies are as varied as the potters who create them. A clay body would be distinctly different for sculpture than it would be for wheel throwing. A wheel throwing clay body would typically be more plastic and smoother. The plasticity is especially important to allow the clay to stretch and hold it's shape as a pot. The relative smoothness prevents the potter's skin from being abraded. A sculpture clay body would typically need to be stronger than for wheel throwing. Added minerals or grog would contribute to it's strength enabling it to stand up under it's own weight. For more information about clay visit Pottery Clay. 1) Electric pottery wheel - The electric pottery wheel is the wheel most commonly used to make pottery today. It consists of a motor, a drive, and a wheel assembly. A pedal or lever is used to adjust the speed of the wheel. 2) Pottery Kick Wheel - A pottery kick wheel consists of a frame, a fly wheel, a drive, and a wheel assembly. The potter kicks the fly wheel to create momentum in the spinning wheel head. The speed is controlled by more or less kicking by the potter. 3) Treadle Wheel - A treadle wheel is similar to a kick wheel except that is has an arm that is pushed with the foot to create a rocking motion which in turn spins the wheel. 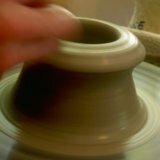 Finally, many people make a career of being a potter. Thousand of people across the country and around the world work as potters. Many of them own their own studios and create functional and/or artistic work which they sell in galleries, at craft shows, and on the internet. Other work in ceramics factories creating production scale handmade pottery. 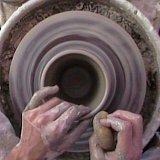 Many potters teach, either in local settings, at secondary schools, or at colleges. 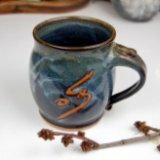 Training to become a potter ranges from self-taught to apprenticeships with experienced potters to University degrees. 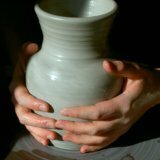 Classes, organizations, and educational materials abound for the person interested in learning to make pottery as a career.